To prepare the salad, place lettuce in a large bowl with salt, olive oil and lime juce. Using tongs, mix all ingrediency together. 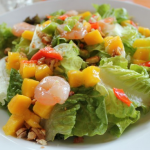 To serve, top the salad with prawns, avocado, carrots and orange, sprinkle of sesame seeds and coriander. Serve with dressing.